NETWORK FINALS: The 8PM SUPERNATURAL rerun lost 0.1 in final numbers. CABLE HIGHLIGHTS: On a low-rated night for cable, MTV’s WILD N OUT won the evening at 0.39. MSNBC’s RACHEL MADDOW SHOW was the #2 show of the night in the demo at 0.36/2.8M, above Fox News’s HANNITY at 0.29/2.8M, and CNN TONIGHT at 0.26/1.2M. Bravo’s MILLION DOLLAR LISTING jumped a tenth to 0.34, and the season finale of CYRUS VS CYRUS was up 0.04 to 0.14. On History, ALONE dropped 0.06 to 0.33, and MOUNTAIN MEN was down 0.02 to 0.33. Disney’s HOTEL TRANSYLVANIA was in the Top 10 at 0.33. On HGTV, FLIP OR FLOP fell 0.13 to 0.32, HOUSE HUNTERS lost 0.07 to 0.29, HOUSE HUNTERS INTL was at 0.29, and VINTAGE FLIP was down 0.09 to 0.19. USA’s QUEEN OF THE SOUTH shed 0.06 to 0.31. We’s GROWING UP HIP-HOP slipped 0.03 to 0.29. 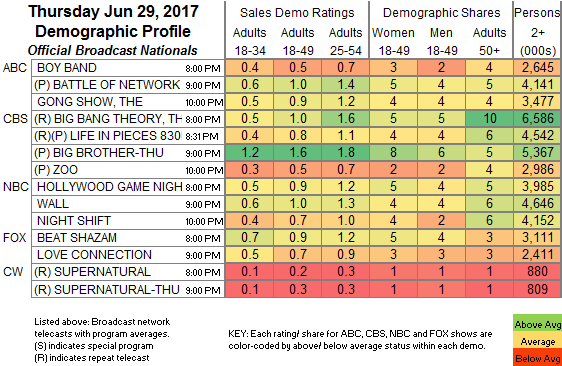 On Lifetime, MARRIED AT FIRST SIGHT lost 0.03 to 0.28, and SECOND CHANCES was up 0.04 to 0.14. Food Network’s BEAT BOBBY FLAY rose 0.03 to 0.28. On A&E, THE FIRST 48 was at 0.26, and COLD CASE FILES was down 0.03 to 0.19. On ID, MURDER AMONG FRIENDS ticked up to 0.23, and SIN CITY JUSTICE was down 0.07 to 0.22. 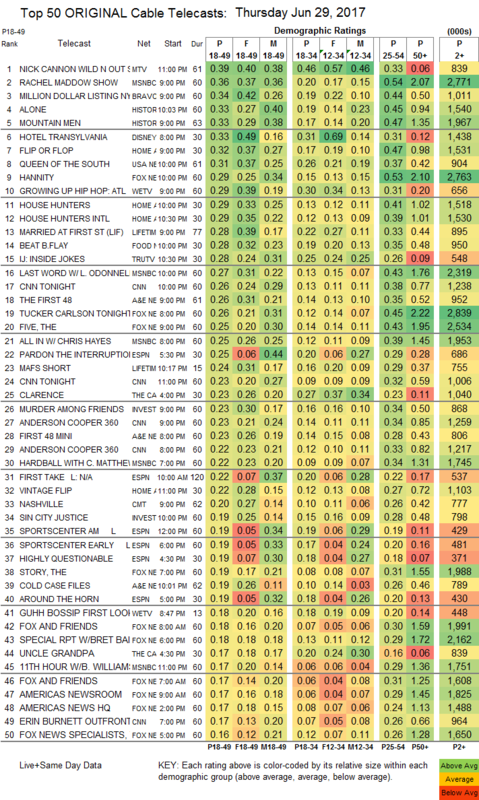 CMT’s NASHVILLE edged up 0.02 to 0.20, and the Nick At Nite run was steady at 0.19/609K. Spike’s THE MIST fell 0.04 to 0.15. POP’s IMPACT WRESTLING dropped 0.03 to 0.07.